The Aga Khan Centre in London’s King’s Cross is a place for education, knowledge, cultural exchange and insight into Muslim civilisations. The Centre is home to three institutions; The Aga Khan Foundation, which seeks to improve the quality of life, enhance self-reliance and promote pluralism in poor and marginalised communities of Asia and Africa, The Aga Khan University Institute for the Study of Muslim Civilisations and The Institute of Ismaili Studies. These organisations work together to bridge the gap in understanding about Muslim cultures and to connect the public to global development issues. To this end, The Aga Khan Centre hosts a variety of events, exhibitions and talks that are open to the public. 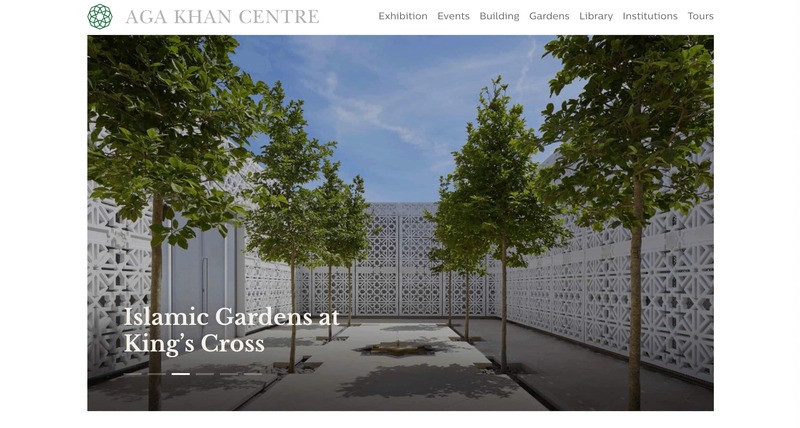 The Aga Khan Foundation UK were looking to create a website for the recently built Aga Khan Centre at King’s Cross, alongside the release of a book about the building itself. They wanted the new website to explain the purpose of the Centre and to raise the profile of the work of the organisations based there, by promoting the free events and exhibitions available to the public. They wanted to ensure that their new website would be engaging and easy to use, so that people could quickly find what they were looking for and stay on the site to learn more. It was also important that it would be straightforward for the Centre staff to manage and update the website content internally. Custom Design. Responsive Theme Development. Forms. Working closely with the Aga Khan Foundation UK team over a series of discovery workshops, we identified the different sorts of users that visit the site. From this, we developed a custom design that would cater for, and be accessible to, all visitors. 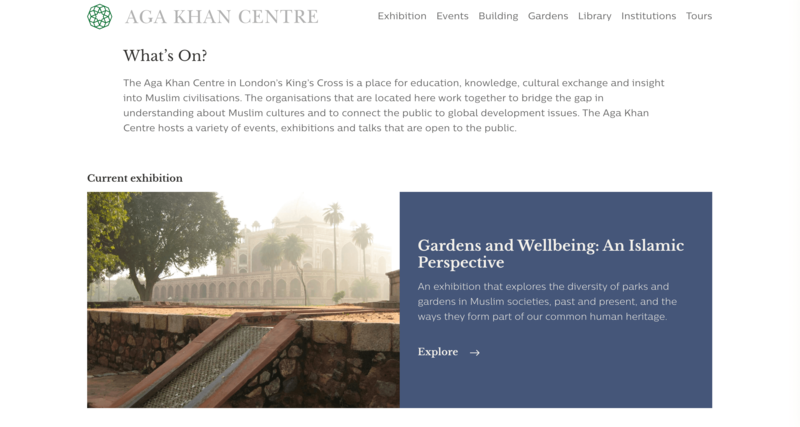 We made the building the main focus of the homepage, with an interactive slider showing the different aspects of the Aga Khan Centre, and clear calls to action that encourage website visitors to visit the physical centre and explore in person. The site was otherwise simply designed, with strong visuals illustrating the upcoming events and exhibitions to invite site visitors to learn more about what is happening, all with the purpose of encouraging people to visit the Centre. We embedded an interactive map, using google maps, making it easy for people to see how to get to the Centre. We also added web forms inviting people to book tours, and a simple contact form for general enquiries. To ensure the new website would be easy for the Aga Khan Centre staff to manage internally, we created a variety of easily editable page types, with the option to add pop-ups, e.g. for specific events they wish to highlight. We also created a central, searchable media content repository where administrators and editors are able to see where specific images are used and stored throughout the site and reuse them as needed. Our detailed training session with all relevant Centre staff ensured that they would feel confident to manage and update the current and any future website content. By building a strong relationship from the outset, we were able to quickly agree joint objectives during our initial discovery session. This enabled our team to build a website that catered for the Aga Khan Centre’s most common anticipated users. Our joint aim was to create something beautiful, simple and effective. To achieve this, we went for a modern design, using watermarks and plenty of white space. Together with the use of Aga Khan Centre’s impressive photo assets, the end result is an elegant site that showcases both the building and its purpose. 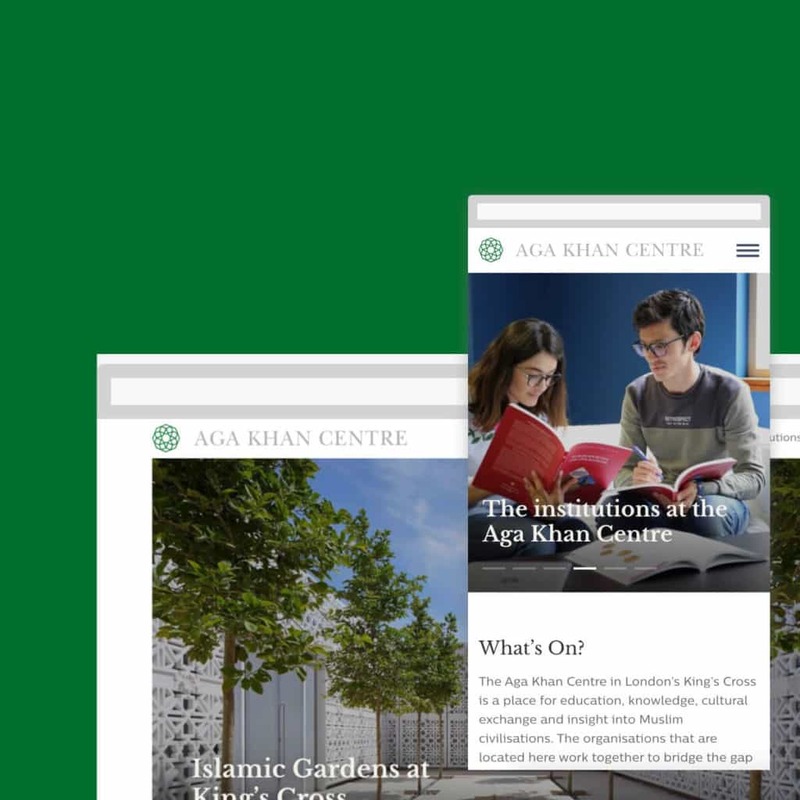 Within just a few weeks of launching, the Aga Khan Foundation UK’s team was impressed by the amount of users already interacting with the site. It’s clear that the the website is attracting people with a strong interest in the Centre’s work, who are keen to find out more.